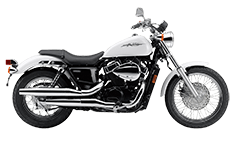 The Honda Shadow series of motorcycles features a wide selection of various bikes with subtle differences and upgrades for riders who seek out a specific type of bike. We like to think of our Viking Bags inventory of luggage for this bike the same way – a huge collection of saddlebags with subtle differences for every style rider. You'll find studded accents, zipper pulls, top carry handles and adjustable straps to better customize the way your saddlebag sits, but you'll also find reinforcement where it's least expected. Viking takes care of every corner of every saddlebag model, so you're left with a choice between the best bags on the market.